Being a multi-trillion business, ecommerce continues to evolve. Retail ecommerce sales totaled USD 1.86 trillion last year. Online shopping has turned into one of the favorite activities amongst avid shoppers. A recent UPS’ study showed that digital channels are a preferred shopping method for 59% respondents. Yet, there are some issues that can make online buyers abandon their carts: having to create a new user account, payment security concerns, a lack of payment options, etc. Delivery services count among such factors. Customers are likely to abandon the cart if delivery options are not flexible enough. They will turn to another shop with more attractive delivery options. Consumers want to choose a delivery day and delivery time. Are your Magento shoppers satisfied with your shipping options? 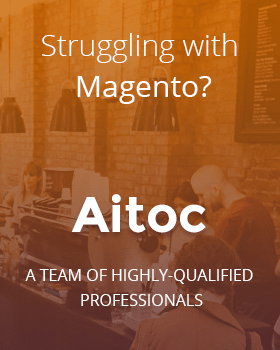 Aitoc developed Delivery Date Plus, a Magento 1 extension, to give merchants the power to improve the logistics experience for their customers. The module helps retailers go beyond the default Magento functionality by offering more flexible delivery options. We’ve prepared a detailed tutorial to demonstrate how this solution works. Once you have the extension installed (by yourself or with our help), open the Admin panel of your store and navigate to System > Configuration > Sales > Checkout > Delivery Date. Click the Delivery Date Plus tab to configure this module’s settings. Select the ‘Yes’ option in the first field to enable the extension at your web store. To make it available for shoppers who take advantage of the ‘shipping to multiple addresses’ option, choose ‘Yes’ in the next field, too. 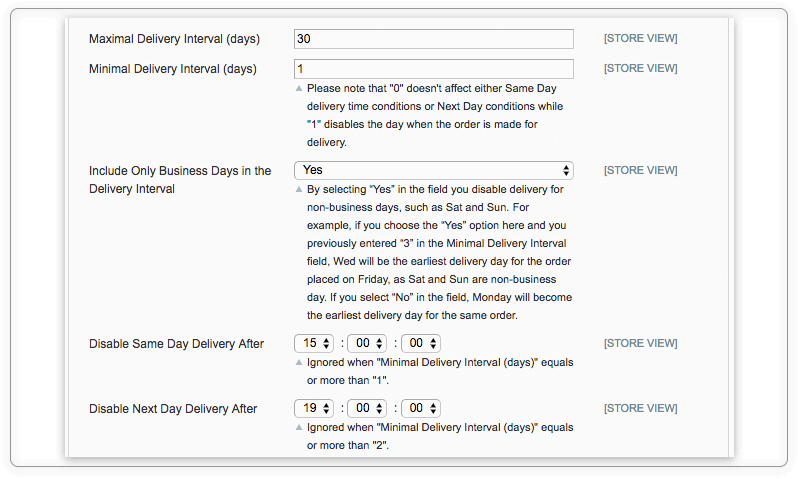 Use the ‘Disable Delivery On’ field to disable the delivery on specific days. Please note that by choosing the ‘No Day’ option together with any day of the week you disable the delivery for this day. Proceed to the ‘Maximal Delivery Interval (days)’ field to specify the maximal delivery interval you’re going to offer. Go to the ‘Minimal Delivery Interval (days)’ and indicate the minimal delivery interval. By entering ‘1’ or a larger number in this field, you disable the same day delivery. If you enter ‘0’ here, you will be able to configure the same date delivery settings by disabling delivery for orders placed after the specific time. You can do the same for the next day delivery option. Feel free to set the date format in a convenient way. ‘Show Comment Field’ is an important option, as it lets customers leave messages for you. For instance, the buyer may let you know that the doorbell is broken and he wants you to give him a call beforehand. Or the client may select a safe place to leave the parcel. If you strive to deliver an outstanding logistic experience, you will certainly need to create your customers an opportunity to pick the delivery time. Just select ‘Yes’ in the ‘Enable Delivery Time Selection’ field and set the time period using the two fields below. Another great thing about this module is that it allows admins to make it work for particular items in the e-store. Just select product categories where you need this functionality and that’s it. Retailers always enjoy plenty of revenue opportunities during the holiday season. But we are all people, and people who work for both your store and your logistic partner want to spend some time with families and friends. Delivery Date Plus gives you the chance to do that without frustrating customers by parcels that delivered too late just because you forgot about them in a holiday rush or the logistics company has suddenly changed its working schedule. Go to Sales > Delivery Time to access the ‘Holidays’ page. Here you can add specific days when you want to disable the delivery. You can click existing holidays to edit them or create a new one. By selecting ‘All’ in the ‘Year’ field you disable the delivery on this day for each year. Or create a one-time holiday by specifying the year. If your managers create orders by themselves in the admin panel, they can also benefit from utilizing the Aitoc’s extension. Make sure to enable at least one shipping method in the admin panel to be able to specify delivery options and add comments while creating an order for the customer. When it comes to the store’s front-end, the functionality looks as simple as that. The competition between commerce players remains intense, and newcomers constantly ignite it. Smart merchants opt for flexible delivery options, as it is an effective method of gaining client loyalty and turning first-time buyers into regular customers. 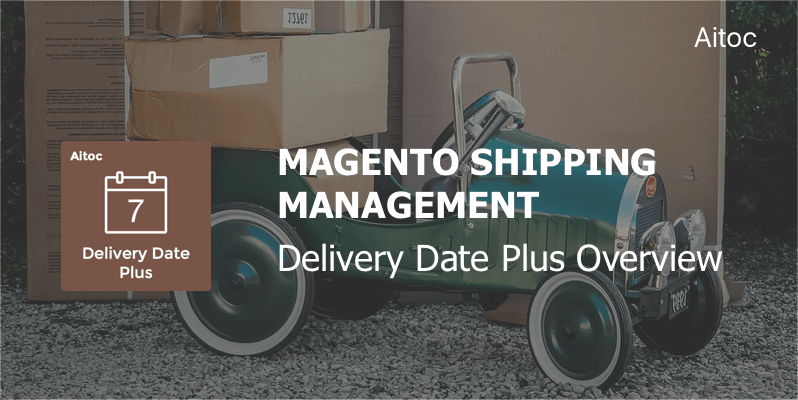 In this article, we showed how Aitoc’s extension, Delivery Date Plus, can help Magento stores improve the default functionality of the installation and allow shoppers to exploit custom shipping options they are offered.